2081. Charles D ENTERLINE [scrapbook] 1 (Alta V BITLER , Daniel , Thomas H , John , Johannes ) was born on 18 Feb 1912 in Limestone Twp, Montour Co, PA. He died in Oct 1959. Charles resided in 1920 in Limestone Twp, Montour Co, PA. He resided in 1930 in Limestone Twp, Montour Co, PA. He worked as Laborer - Farm in 1930. Charles married Lorma A NIPLE, daughter of Dio Maine NIPLE and Katharine M. Lorma was born on 5 Oct 1911 in PA. She died on 21 Aug 1988 in Waldorf, Charles Co, MD. She was buried in Cedar Hill Cemetery, Suitland, Prince George's County, MD. 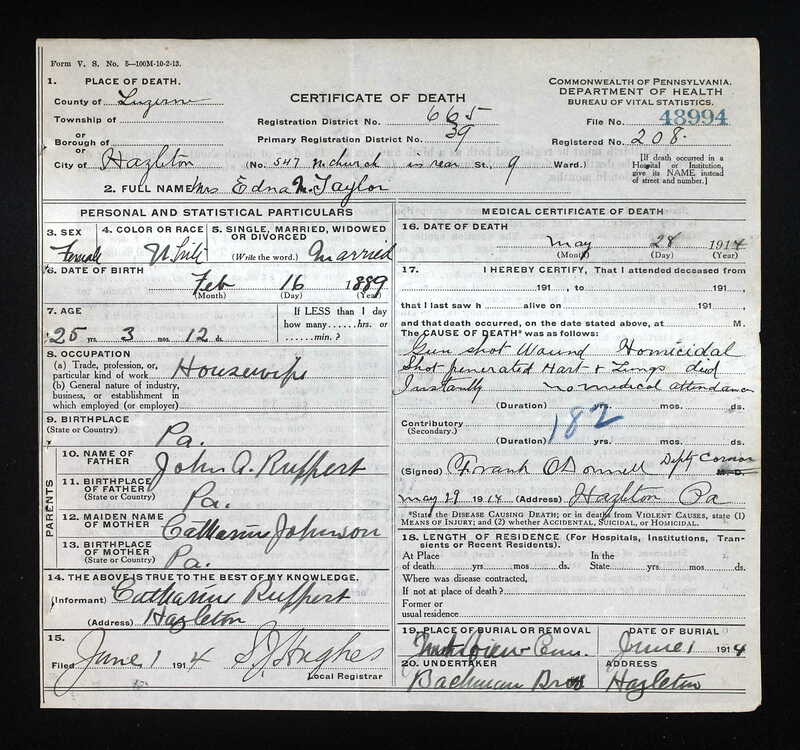 Lorma resided in 1920 in Turbotville, Montour Co, PA. She resided in 1930 in Turbotville, Montour Co, PA. She was issued a social security number in 1952 in DC. + 5328 M i Charles Maine "Chuck" ENTERLINE was born on 1 Jan 1935. He died on 6 Mar 2012. + 5329 M ii Dio Maine ENTERLINE was born on 21 Nov 1950. He died on 6 Jul 2014. 2082. Mary Louise ENTERLINE 1 (Alta V BITLER , Daniel , Thomas H , John , Johannes ) was born on 7 Jan 1917 in PA. She died in May 1986 in Bloomsburg, Columbia Co, PA. She was buried in Elan Memorial Park, Lime Ridge, Columbia Co, PA.
Mary resided in 1920 in Limestone Twp, Montour Co, PA. She resided in 1930 in Limestone Twp, Montour Co, PA. She resided in Apr 1980 in Bloomsburg, Columbia Co, PA.
Mary married Robert C MILLER 1. Robert was born on 14 Feb 1916 in PA. He died on 24 Apr 2010 in Bloomsburg, Columbia Co, PA. He was buried in Elan Memorial Park, Lime Ridge, Columbia Co, PA.
Robert was a member of St. Matthews Lutheran Church in Bloomsburg, Columbia Co, PA.
2083. Ruth McLaughlin BITLER [scrapbook] 1, 2, 3, 4 (Uriah Myers , Daniel , Thomas H , John , Johannes ) was born on 17 Aug 1903 in PA. She died on 15 Jun 1994 in Ocean City, Worcester Co, MD. Ruth resided in 1910 in Montour Co, PA. She resided in 1920 in Anthony Twp, Montour Co, PA. She resided about 1934 in West Ocean City, MD. She resided in Mar 1946 in Berlin, MD. She was issued a social security number in 1963 in MD. She resided in 1994 in Ocean City, Worcester Co, MD. Ruth married Harry Milton BROWN [scrapbook] 1, 2, 3, son of Henry BROWN and Virginia WHITTINGTON, on 6 Oct 1928 in M.E. Church, Philadelphia, Philadelphia Co, PA. Harry was born on 25 Jul 1872 in Baltimore, Baltimore Co, MD. He died on 31 Mar 1958 in Ocean City, Worcester Co, MD. He was buried in Berlin, Worcester Co, MD. Harry resided about 1934 in West Ocean City, MD. He resided in Mar 1946 in Berlin, MD. He served in the military with Spanish American War Veteran. He worked as Photographer. + 5331 M i Dale Whittington BROWN Sr was born on 2 Jun 1930. He died on 4 Jun 2007. + 5332 M ii Neil Bitler "Buck" BROWN was born on 19 Nov 1931. He died on 18 Dec 2015. + 5333 M iii William Milton BROWN. Barbara June BROWN [scrapbook] was born on 7 Jun 1929 in Ottawa (near Diefenbach), Montour Co, PA. She died on 7 Jun 1929 in Anthony Twp, Montour Co, PA. She was buried on 8 Jun 1929 in Turbotville, Montour Co, PA.
+ 5335 M v Gordon Oliver BROWN. + 5336 F vi Marylin Ruth BROWN was born on 23 May 1933. She died on 16 Nov 1993. 2084. Pauline C BITLER [scrapbook] 1, 2 (Uriah Myers , Daniel , Thomas H , John , Johannes ) was born on 14 May 1905 in Anthony Twp, Montour Co, PA. She died on 5 Nov 2003 in Danville, Montour Co, PA. She was buried in Turbotville Cemetery, Northumberland Co, PA.
Pauline resided in 1910 in Montour Co, PA. She resided in 1920 in Anthony Twp, Montour Co, PA. She resided in 1942 in Montour Co, PA. She resided in Mar 1946 in R. D. 1, Turbotville, PA. She was issued a social security number in 1973 in PA. She resided in 1979 in Danville, Montour Twp, Montour Co, PA. She resided in 2003 in PPL Road, Danville, PA. She worked as Nurse. She graduated with Nurse Training in South Hampton, NY. She worked as Devitt Camp in Allenwood. She was a member of Member in St James Episcopal Church, Exchange, Montour Co, PA.
Pauline married David J LITCHARD 1, son of Alfred H LITCHARD and Eldora A FEESE. David was born on 12 Sep 1902. He died in Jun 1983 in Danville, Montour Co, PA. He was buried in Turbotville Cemetery, Northumberland Co, PA.
David resided in 1910 in Anthony Twp, Montour Co, PA. He worked as Farmer in 1942 in Anthony Twp, Montour Co, PA. 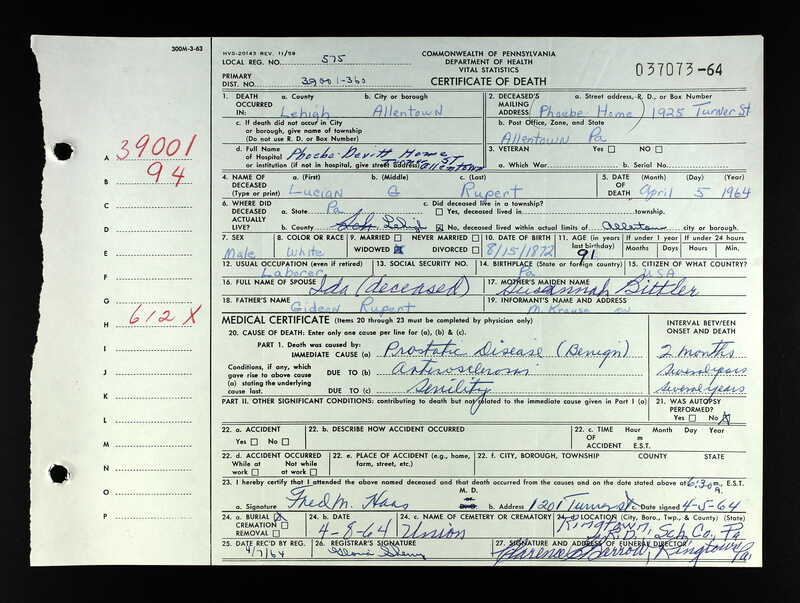 He resided in Mar 1946 in R.D. 1, Turbotville, PA. He was issued a social security number in 1955/1957 in PA.
+ 5337 M i David Myers LITCHARD was born on 15 Oct 1942. 2085. Grace Fiester BITLER 1, 2 (Uriah Myers , Daniel , Thomas H , John , Johannes ) was born on 14 May 1905 in PA. She died on 3 Nov 1982 in Montoursville, Lycoming Co, PA. She was buried on 6 Nov 1982. Grace resided in 1910 in Montour Co, PA. She resided in 1920 in Anthony Twp, Montour Co, PA. She resided in Mar 1946 in Montoursville, Lycoming Co, PA. She was issued a social security number in 1969 in PA. She resided in 1979 in Montoursville, Lycoming Co, PA.
Grace married Glenn Harvey HESSLER 1, son of Harvey A HESSLER and Ida May FRYMIRE, about 1925. Glenn was born on 3 Jul 1906 in Lycoming Co, PA. He died on 21 Apr 1991 in Montoursville, Lycoming Co, PA.
Glenn resided in 1920 in Gamble Twp, Lycoming Co, PA. He resided in 1930 in Montoursville, Lycoming Co, PA. He resided in Mar 1946 in Montoursville, Lycoming Co, PA. He was issued a social security number before 1951 in PA.
+ 5338 M i Don Bitler HESSLER. + 5339 F ii Pauline Elizabeth HESSLER. 5340 F iii Naomi HESSLER. 5341 F iv Glenda HESSLER. Glenda married Werner O UNZELMANN. 2087. Elizabeth Hazel "Hazel" BITLER [scrapbook] 1, 2 (Uriah Myers , Daniel , Thomas H , John , Johannes ) was born on 22 Feb 1909 in Ottawa, Montour Co, PA. She died on 18 Aug 1948. 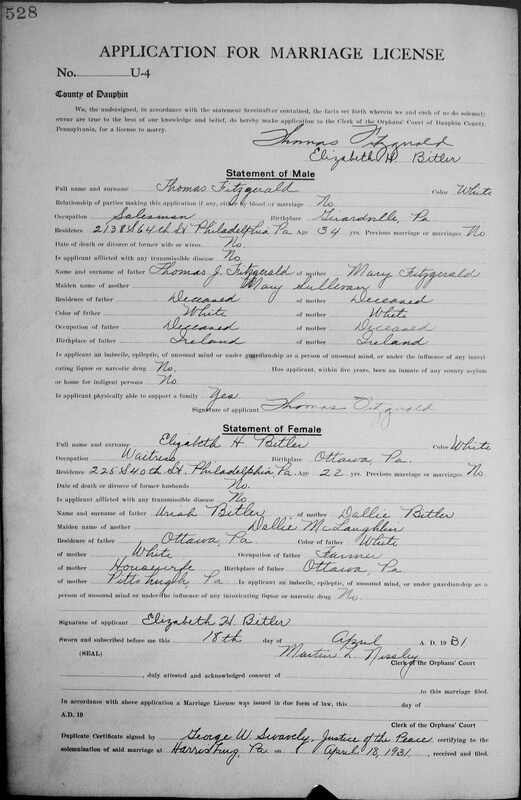 Hazel resided in 1910 in Montour Co, PA. She resided in 1920 in Anthony Twp, Montour Co, PA. She resided in Apr 1931 in 225 S 40th St, Philadelphia, Philadelphia Co, PA. She worked as waitress in Apr 1931. 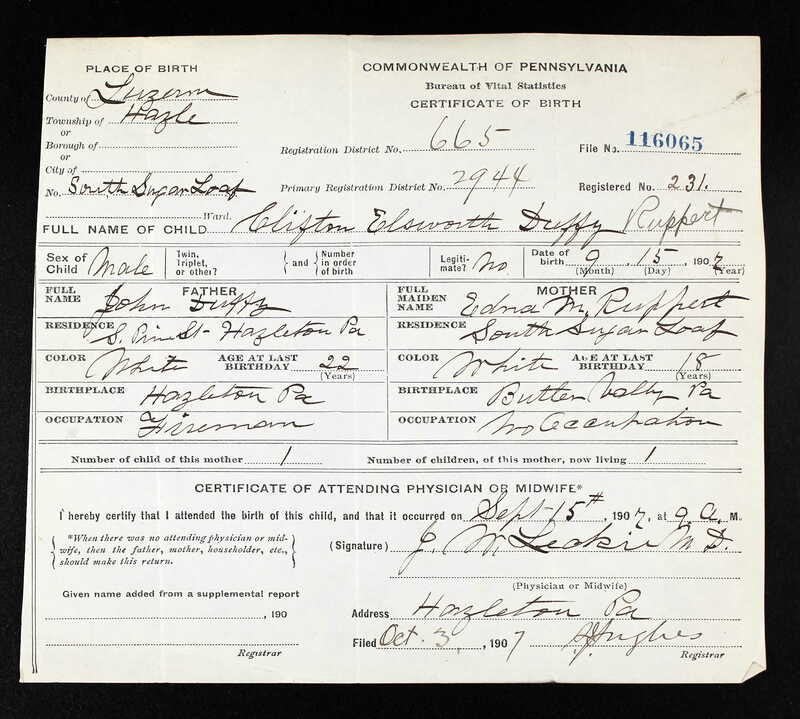 She resided in Mar 1946 in Philadelphia, PA.
Hazel married 1 Thomas FITZGERALD [scrapbook] 2, son of Thomas J FITZGERALD and Mary SULLIVAN, on 18 Apr 1931 in Harrisburgh, Dauphin Co, PA. Thomas was born about 1897 in Girardville, Schuylkill Co, PA.
Thomas resided in Apr 1931 in 2138 S 64th St, Philadelphia, Philadelphia Co, PA. He worked as salesman in Apr 1931. He resided in Mar 1946 in Philadelphia, PA.
+ 5342 F i Patricia FITZGERALD. 2088. William McLaughlin BITLER 1, 2 (Uriah Myers , Daniel , Thomas H , John , Johannes ) was born on 29 Nov 1910 in Turbotsville, Montour Co, PA. He died on 29 Mar 1970 in Wooster, Wayne Co, OH. He was buried in Wooster, Wayne Co, OH. William resided in 1920 in Anthony Twp, Montour Co, PA. He resided in 1930 in Anthony Twp, Montour Co, PA. He resided in 1940 in Anthony Twp, Montour Co, PA. He worked as laborer - general in 1940. He resided in Mar 1946 in Mechanicsburg, PA. He was issued a social security number before 1951 in PA. He worked as Engineering Technician Ohio Highways Dept. 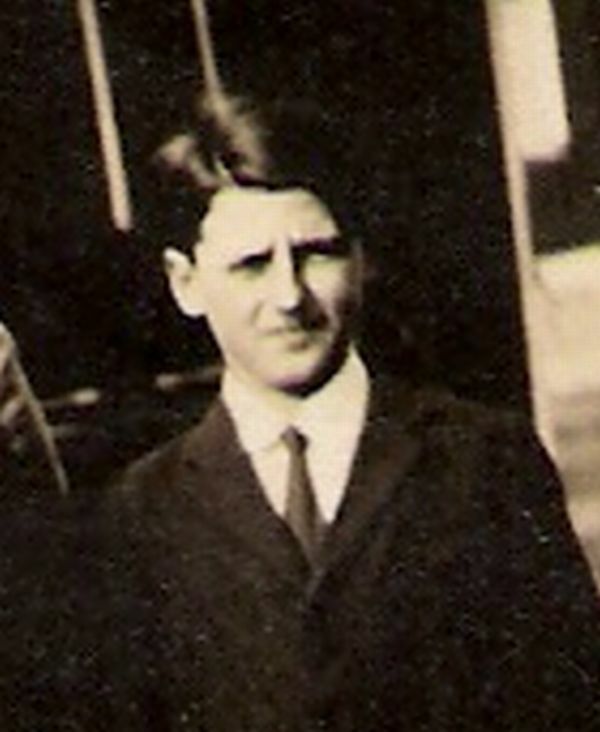 William married Helen Margaret YEAGER about 1930. Helen was born on 25 Jul 1915. She died on 13 May 2003 in Wooster, Wayne Co, OH. 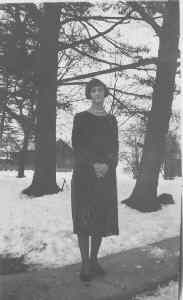 Helen graduated with Susquehannah University in 1937. She was issued a social security number in 1964 in OH. She resided in May 2003 in Wooster, Wayne Co, OH 44691. + 5343 F i Rachael Barbara "Rae" BITLER. 2090. Marguerite Jane BITLER [scrapbook] (Sherman Ellsworth , Daniel , Thomas H , John , Johannes ) was born on 27 Jul 1933 in Williamsport, Lycoming Co, PA. She died on 13 Sep 1997 in Lewisburg, Union Co, PA.
Marguerite resided in 1940 in 8 S Main St, Watsontown, Northumberland Co, PA. She was issued a social security number in 1952/1954 in PA. She graduated with BS Education from Bloomsburg University in 1967. She resided in 1997 in Lewisburg, Union Co, PA.
Marguerite married Harold Bell WRIGHT. Marguerite also married Joseph Anthony SAVIDGE [scrapbook] 1, son of Joseph P SAVIDGE and Anna DOMULEWICZ. Joseph was born on 9 Jul 1930 in Shamokin, Northumberland Co, PA. He died on 1 Mar 1993. 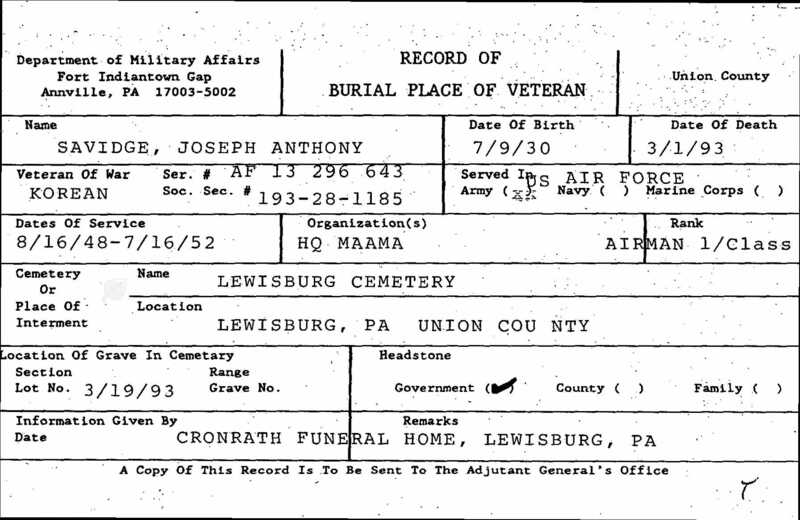 He was buried in Lewisburg Cemetery, Lewisburg, Union Co, PA.
Joseph was issued a social security number in 1952/1954 in PA. He served in the military with U.S. Army Air Corp - Airman 1st Class from 16 Aug 1948 to 16 Jul 1952 in Korean War. He resided in 1977 in Lewisburg, Union Co, PA.
2095. 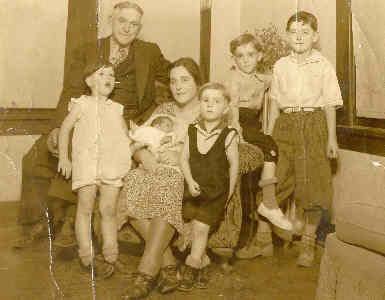 Cora May RUPERT (Johnathan Adam RUPERT , Susannah H BITLER , James , John , Johannes ) was born on 13 Dec 1883 in Tomhicken, Luzerne Co, PA. She died on 18 Feb 1975 in Valley Crest Home, Wilkes Barre, Luzerne Co, PA.
Cora resided in 1900 in Cleveland St, Hazel Twp, Luzerne Co, PA. She resided in 1910 in 580 Carson St, Hazleton, Luzerne Co, PA. She resided in 1920 in 118 East Broad St, West Hazleton, Luzerne Co, PA. She resided in 1930 in 785 Roosevelt St, Hazleton, Luzerne Co, PA.
Cora married James TAYLOR about 1899 in PA. James was born about 1883. He died on 20 Oct 1947 in Luzerne Co, PA.
James resided in 1900 in Cleveland St, Hazel Twp, Luzerne Co, PA. He worked as Laborer - Mines in 1900. He resided in 1910 in 580 Carson St, Hazleton, Luzerne Co, PA. He worked as Laborer - Coal Mine in 1910. He resided in 1920 in 118 East Broad St, West Hazleton, Luzerne Co, PA. He worked as Fire Boss - Coal Mine in 1920. He resided in 1930 in 785 Roosevelt St, Hazleton, Luzerne Co, PA. He worked as Asst Mine Foreman - Coal Mine in 1930. + 5346 M i John Anderson TAYLOR was born in Sep 1899. + 5347 F ii Catherine Jane TAYLOR was born about 1904/1907. + 5348 F iii Jean McDougal TAYLOR was born about 1906. 2096. Clarence RUPERT [scrapbook] (Johnathan Adam RUPERT , Susannah H BITLER , James , John , Johannes ) was born on 28 Feb 1885 in Drums, Luzerne Co, PA. He died on 6 Jan 1943 in West Hazleton, Luzerne Co, PA. He was buried on 9 Jan 1943 in Sec 2, Mountain View Cemetery, West Hazleton, Luzerne Co, PA.
Clarence resided in 1900 in Cleveland St, Hazel Twp, Luzerne Co, PA. He worked as Laborer - Mines in 1900. He resided in 1910 in 580 Carson St, Hazleton, Luzerne Co, PA. He worked as Laborer - Coal Mine in 1910. He resided in 1920 in 155 Bennet Ct, Hazleton, Luzerne Co, PA. He worked as Miner - Coal Mines in 1920. He resided in 1930 in 102 W Green St, West Hazleton, Luzerne Co, PA. He worked as Miner - Coal Mines in 1930. He resided in 1942 in 102 W Green St, West Hazleton, Luzerne Co, PA. He worked as Hazel Mines in 1942 in Hazleton, Luzerne Co, PA.
Clarence married Beulah ANDREWS [scrapbook] about 1910 in Luzerne Co, PA. Beulah was born in 1891. She died in 1971. She was buried in 1971 in Sec 2, Mountain View Cemetery, West Hazleton, Luzerne Co, PA.
Beulah resided in 1910 in 580 Carson St, Hazleton, Luzerne Co, PA. She resided in 1920 in 155 Bennet Ct, Hazleton, Luzerne Co, PA. She resided in 1930 in 102 W Green St, West Hazleton, Luzerne Co, PA. She resided in 1942 in 102 W Green St, West Hazleton, Luzerne Co, PA.
+ 5349 M i Clarence W "Cal" RUPERT was born on 24 Mar 1913. He died on 1 Mar 2002. 2098. Edna M RUPERT [scrapbook] (Johnathan Adam RUPERT , Susannah H BITLER , James , John , Johannes ) was born on 16 Feb 1889 in Butter Valley, Luzerne Co, PA. She died on 28 May 1914 in Hazleton, Luzerne Co, PA. She was buried on 1 Jun 1914 in Mountain View Cemetery, West Hazleton, Luzerne Co, PA.
Edna resided in 1900 in Cleveland St, Hazel Twp, Luzerne Co, PA. She worked as At School in 1900. 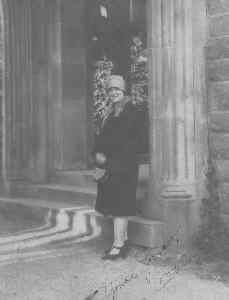 She resided in 1910 in 84 Sugarloaf Rd, Hazleton, Luzerne Co, PA. She resided in May 1914 in 547 N Church St, Hazleton, Luzerne Co, PA. The cause of her death was Gun Shot Wound - Homicide (By Husband). Edna married John DUFFY. 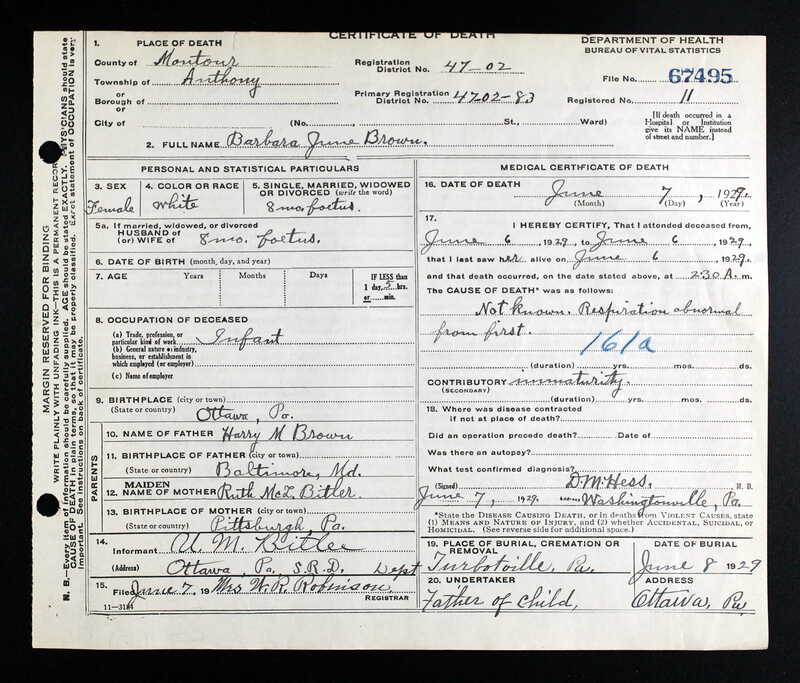 John was born about 1885 in Hazleton, Luzerne Co, PA.
John resided in Sep 1915 in S Pine ST, Hazleton, Luzerne Co, PA. He worked as fireman in Sep 1915. Clifton Elsworth RUPERT [scrapbook] was born on 15 Sep 1907 in South Sugar Loaf, Hazel Twp, Luzerne Co, PA.
Clifton resided in 1910 in 84 Sugarloaf Rd, Hazleton, Luzerne Co, PA.
Edna also married John TAYLOR [scrapbook] about 1910. 2102. Florence V "Flora" SEIWELL [scrapbook] 1, 2, 3 (Mary Catherine RUPERT , Susannah H BITLER , James , John , Johannes ) was born on 27 Feb 1878 in Nuremberg, North Union Twp, Schuylkill Co, PA. She died on 1 Jun 1960 in Drums, Butler Twp, Luzerne Co, PA. She was buried 4 on 4 Jun 1960 in Sec 5, Mountain View Cemetery, West Hazleton, Luzerne Co, PA.
Flora was baptized on 24 Apr 1878 in Emanuel Reformed, Nuremberg, Pa.. She resided in 1880 in North Union Twp, Schuylkill Co, PA. She worked as At Home in 1880. She resided in 1900 in Black Creek Twp, Luzerne Co, PA. She worked as Keeping House in 1900. 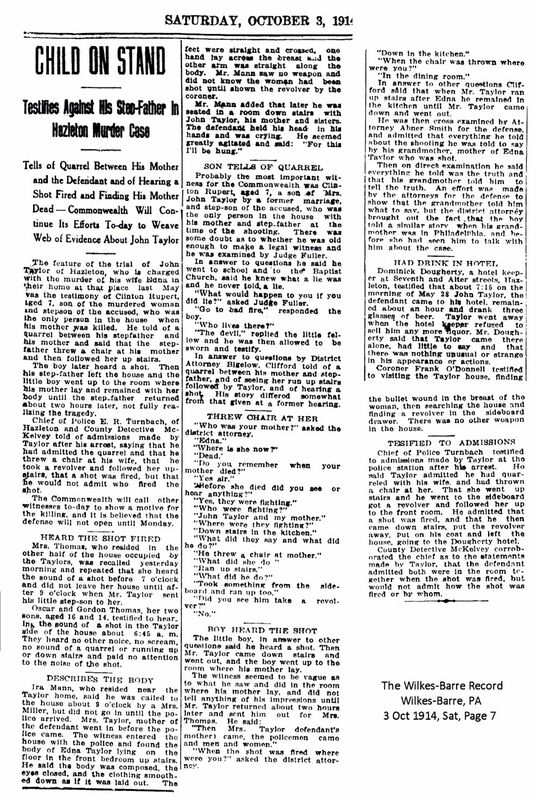 She resided in 1910 in Conyngham, Luzerne Co, PA. She resided in 1920 in 27 Beech St, Hazleton, Luzerne Co, PA. She resided in 1930 in 55 E Madison Ave, West Hazleton, Luzerne Co, PA. She resided in Dec 1943 in Drums, Luzerne Co, PA. She resided at Edgewood & Wilkes-Barre Crossroads, Butler Twp, Luzerne Co, PA in 1960. Flora married 1 Lucian G RUPERT [scrapbook] 2, son of Gideon RUPERT and Susannah H BITLER "Hannah", in Nov. Lucian was born 3 on 15 Aug 1872 in Union Twp, Schuylkill Co, PA. He died on 5 Apr 1964 in Phoebe-Divitt Home, Allentown, Lehigh Co, PA. He was buried on 8 Apr 1964 in Union Cemetery, Ringtown, Schuylkill Co, PA.
Lucian resided in 1880 in North Union Twp, Schuylkill Co, PA. He resided in 1890 in North Union Twp, Schuylkill Co, PA. He worked as laborer in 1890. He resided in 1900 in North Union Twp, Schuylkill Co, PA. He worked as Farm Laborer in 1900. He resided in 1910 in Center St, Conyngham Twp, Columbia Co, PA. He worked as Laborer - Coal Mine in 1910. He resided in 1920 in Main St, Ringtown, Schuylkill Co, PA. He worked as Laborer - Farm Manager in 1920. He resided in 1930 in E Main St, Ringtown, Schuylkill Co, PA. He worked as laborer - public highway in 1930. 5351 F i Algeria Cindarella CROLL is printed as #2135. Flora also married 1 Maurice Claude CROLL "Claude" [scrapbook] 1, 2, 3, son of Martin M CROLL and [Female], on 10 Jun 1902. Claude was born on 16 Sep 1883/1884 in Black Creek Twp, Luzerne Co, PA. He died on 20 Dec 1969 in Berwick, Columbia Co, PA. He was buried 4 on 23 Dec 1969 in Sec 5, Mountain View Cemetery, West Hazleton, Luzerne Co, PA.
Claude resided in 1900 in Black Creek Twp, Luzerne Co, PA. He resided in 1910 in Conyngham, Luzerne Co, PA. He worked as Fireman - Coal Mine in 1910. He resided in 1920 in 27 Beech St, Hazleton, Luzerne Co, PA. He worked as Fireman - Railroad in 1920. He resided in 1930 in 55 E Madison Ave, West Hazleton, Luzerne Co, PA. He worked as Miner - Coal Miner in 1930. Maurice M. CROLL [scrapbook] 1 was born in 1903 in PA. He died in 1918. He was buried in 1918 in Sec 5, Mountain View Cemetery, West Hazleton, Luzerne Co, PA.
Maurice resided in 1910 in Conyngham, Luzerne Co, PA.